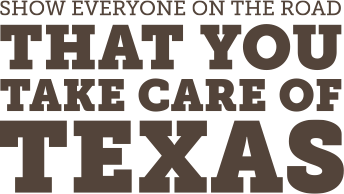 Did you know that Take Care of Texas has a patch for participating Girl Scouts and Boy Scouts councils? Check out the selection of activities that Scouts can choose from when earning a patch. There are a lot of options! Daisy: Must complete five activities from the activity list. Brownie: Complete eight activities from the activity list. Junior: Complete ten activities from the activity list plus two community service hours of conservation work. Examples include park/school clean-ups, removing exotic species, and planting trees. Cadettes/Seniors/Ambassadors: Complete twelve activities from the activity list plus a conservation project/presentation relating to the Take Care of Texas mission. See the activity list for more information on the project. We are expanding to new councils. If you would like your council to offer the patch, email educate@tceq.texas.gov. 1. Merit Badges: Earn three merit badges from the following list: Environmental Science, Soil and Water Conservation, Energy, Fish and Wildlife Management, Forestry, Sustainability, Gardening, Oceanography and Plant Science. 2. Community Service Hours: In addition to the merit badges, Scout is required to complete two hours toward a conservation project. 3. Complete patch application, signed by the Scout, the Scoutmaster and submit the application to your local area council. View and download the patch application. 2. Conservation project: Scout must complete a project in line with the Take Care of Texas mission that includes at least eight hours of service. 3. Presentation: Scout must submit to TCEQ either a 7-10 photo/slide presentation or a 3-5 minute video describing the project, how it relates to TCOT mission, and knowledge gained from experience. 4. Complete pin application, signed by the Scout, the Scoutmaster and email this signed application to educate@tceq.texas.gov along with your photo/slide presentation or video. View and download the pin application. We are expanding to new councils. 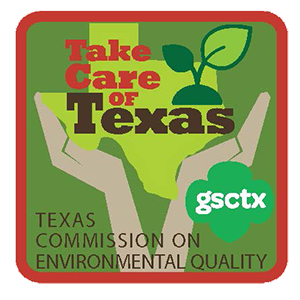 If you would like your council to offer the patch and pin, email educate@tceq.texas.gov.